Several weeks ago, I began a search for the perfect summer travel shoes. Good travelers know that shoes take up way too much packing space, so it was important in my endeavors to search for that one pair that could do it all, without leaving bleeding blisters to contend with. One challenge for the summer, however, is finding sturdy, comfortable shoes that are fashionable, can be worn without socks, and can transition from a walking tour to a sit-down dinner. Many suggestions were made, lots of shoes were tried, and now I have the results of my often painstaking, blister-inducing research. Below are five tips for finding the perfect summer travel shoes with my final recommendation for the one. Suede and soft leather mold to the foot rather than rub against it. Patent leather, hard leather, and stiffer, coarser fabrics located anywhere near the heels or ankles may start off feeling comfortable, but when heat, perspiration, and miles combine, blisters are sure to follow. As an example, I wore the Merrells pictured below for a two-mile walk for coffee. At first they seemed fairly comfortable, but by the end of the first mile, I had blisters on the backs of both heels and the undersides of my ankles. The fabric on these shoes is very coarse. The stiffness and height of the ankle collar and heel support dug into my skin. By the time I finished the second mile, my feet were bleeding. I have not worn them since. Merrell’s Mimosa Emme Mary Jane are cute, but they rubbed some of the worst blisters I’ve received all summer. Slingbacks and thin straps not only cause blisters, they can dig into toes and heels, leaving the skin with terrible gashes. Ouch! 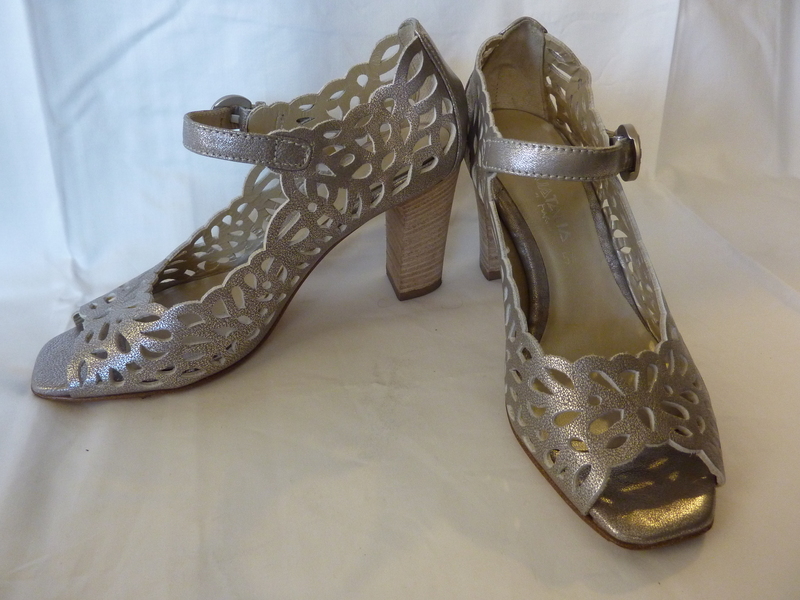 I love these heels from Aquatalia, but I can’t wear them very far before the cut-outs start to dig in. The shoes themselves are comfortable, but the longer I walk in them, the more my skin rubs against the cut-outs in the leather. Within a half-mile walk to the theater, I had blisters the shape of some of the cut-outs in these cute shoes–but trust me when I tell you, my foot was far from cute when it was all over! I love these shoes, but the cut-outs in the leather, which make them so unique, dig into toes and cause painful blisters. The stiffer the shoe, the more likely you are to develop blisters and callouses at the points where the shoe should naturally bend (near the joints of the toes and ball of the foot). If you cannot bend the toe toward the center of the shoe without a lot of effort, that shoe is stiff and inflexible. Put it down and walk away. One example of this was a pair of TSUBO brand shoes I tried. The support and cushioning inside the shoe were good, but it was incredibly stiff and unbending. As I foolishly walked two miles to dinner in them, the plasticky top of the toe box creased over my big toe and created a nasty blister. Sadly, they were also stiff around the ankles and heels, so I got blisters there too. I liked the sportiness of these TSUBO’s and envisioned wearing them all over town. Sadly, they are quite stiff in the toebox and rubbed blisters onto the tops of my toes, as well as on my heels and ankles. 4. Give your toes some wiggle room — but not too much! Toes shouldn’t squeeze together into the shoe, nor should the shoe be so large that it dangles off your foot when you walk. A tight toe box can rub your toes and cause blisters and callouses, if not also other aches and pains, whereas a floppy, wobbly shoe (such as a flip flop or a shoe that is too large) is not stable enough for two-mile walks over uneven terrain. Make sure the shoe fits secure, but not tight. Don’t wear flip flops or other shoes that you have to hold on to with your toes. Although the leather is super soft on the 1-inch pumps by Cole Haan shown below, they are just narrow enough to pinch my toes and cause discomfort over the course of an afternoon. If your foot is particularly narrow about the toes, this style of shoe might be just the thing for you this summer. My toes, on the other hand, had to cram themselves into a tight space. Although the leather has some stretch and give, I still ended up with a blister on my smallest toes because it was too tight. Cute 1-inch sandals from Cole Haan pinch the toes. The ECCO sandals below are some of my favorite shoes for wearing when I know I’m not going to be going very far–less than a mile. Beyond that, though, they require too much effort to keep them on. My toes start to ache and the strap that goes in between my toes starts to rub. For flip flops, these are very comfortable and fairly stylish. Unfortunately, they aren’t secure on my foot such that, when I walk long distances, I have to hold them on with my toes. Textured rubber soles grab the earth and keep you steady, unlike smooth, inflexible wood or some other hard materials out there. Rubber soles are also the best for cushioning the hard earth beneath your hard-working feet. 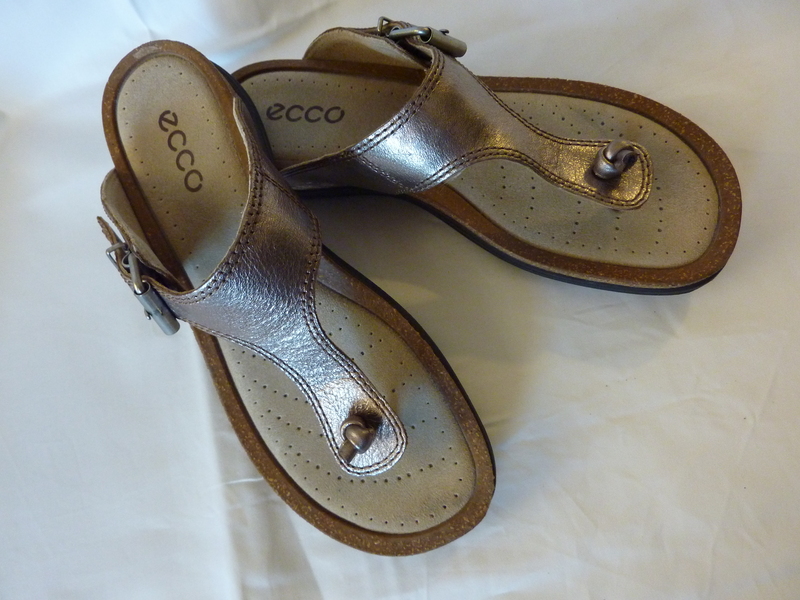 The Ecco Yucatan sandals are the near-perfect specimen for summer travel shoes. If they weren’t so sporty I could wear them inside restaurants and other fancy establishments. Still, they come so close to perfect that I chose them as a summary example, before revealing to you my final choice for THE summer travel shoe. First, notice that they are made of soft leather and fabric uppers. 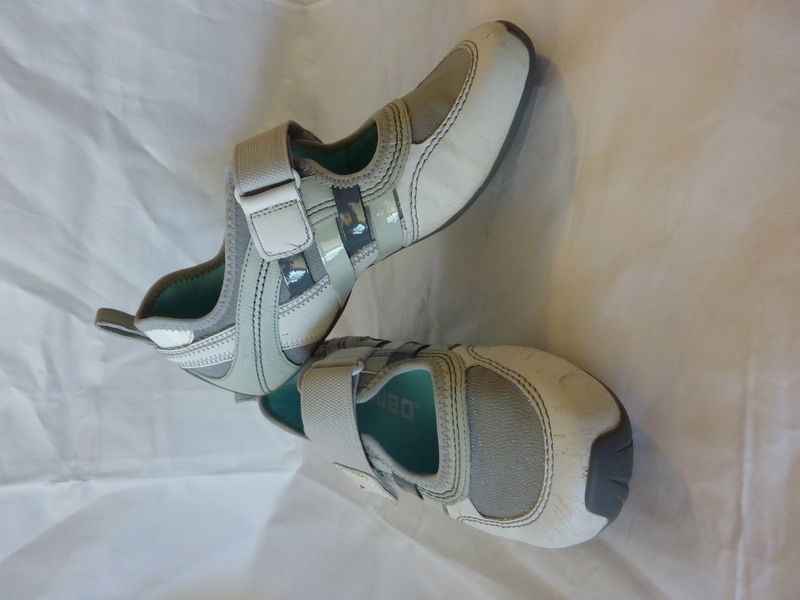 Their straps are thick and padded–no blisters. They are also adjustable at the heel, the top of the foot, and the toe areas, so I can tighten or loosen them depending on what my foot needs. The soles are made of lightweight rubber and the bottoms are textured so I never worry about losing my footing, whether I’m walking down a broken sidewalk to the Farmers Market or along a gravelly trail in the Boyce Thompson Arboretum. The only thing keeping them from being perfect summer travel shoes is that I wouldn’t wear them with a dress or skirt to a sit-down restaurant in downtown Toronto, St. Paul, or Austin. It is without further ado that I introduce you to the most versatile summer travel shoe I could find: the Naot Kayla sandal. It’s not the most gorgeous shoe I’ve ever owned, but it is the one I pack when I am packing the lightest. They rank up there as the most comfortable shoes I have ever worn. The leather straps are soft enough and thick enough that they do not dig into my skin. There is an adjustable strap that goes over the top of my foot, so I can secure it tighter or loosen it up. The leather gives way to my feet and hugs them gently. I have walked miles in these shoes and never gotten a blister. The footbed is made of cork, latex, and suede, so it molds to my foot, providing personalized support. The soles are textured EVA, so they are shock-absorbing, as well as stabilizing. My feet have also never felt fatigued or achy after wearing these shoes. My biggest complaint about them is a complaint I make about any sandal: they are masters at collecting rocks when I walk over gravelly pathways. Still, they can truly go the distance when walking all day. Their style is as flexible as their soles. I can go anywhere in them and experience pretty much any activity under the summer sun. And that is what sets them apart: the Naot Kaylas are a pair of shoes I can wear in a variety of situations. The Naot Kayla comes in a variety of colors. The ankle strap is adjustable, the footbed molds to my foot, and the sole is a textured EVA that allows for flexibility while providing stability. Have you found a perfect pair of summer shoes that can walk the miles and see you through lots of situations? Post the information here and help us compile a better list for travelers around the world. I really like my Merrell Breeze shoes to walk around in, but I wouldn’t wear them in a “dress-up” situation. Thanks for the tips! 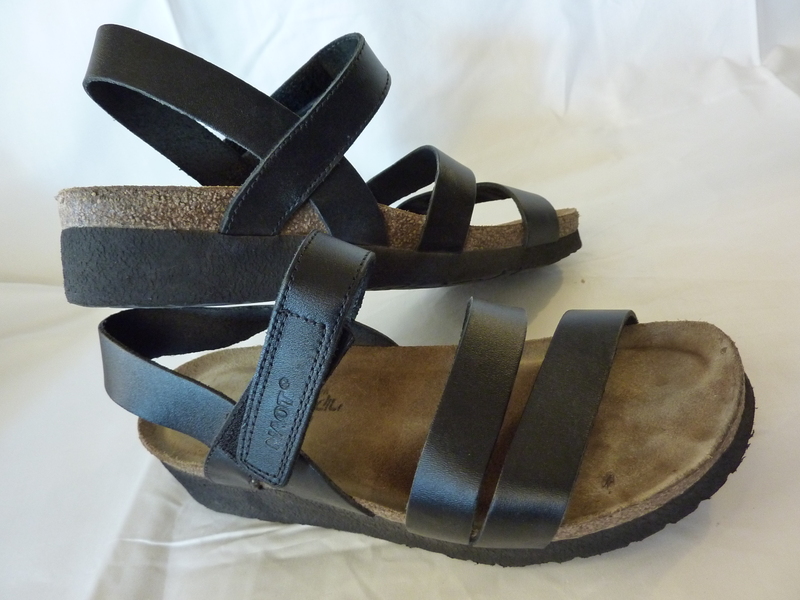 Hello Sherri, I am Birkenstock biggest fan 🙂 owned 3 pairs of different sandals the last couple of years and I practically live in them during summer, my feet are so squared I need open toes sandals always, the Ecco sandals you have above might work for me. Haven’t seen Naot Kayla shoes before but will look it up. Hi Esti! Thank you for the recommendation! You’ve given us another idea to add to the list of great summer shoes. I have heard great things about the comfort of Birkenstocks! This is a great write up, although I’m a guy all of these tips work for us too. I’m actually working on a pretty unique casual flexible travel shoe at the moment due for release summer 2012, and dare I say it – they’re unisex. Having done a lot of research and being a keen traveller myself I think we have most if not all of your points covered and then some. Robin, I’m so glad you brought up the “guy factor”! I felt pretty bad for leaving the guys out on my recommendation, but like you said, the rules still basically apply. Plus, I’m so thankful you provided your own recommendation and I cannot wait to see what the Freedom Shoe is all about when it comes out. I’ve signed up at your website freedomshoe.com to receive updates, but I would be grateful if you’d stop back by here when the shoe is ready and “unveil it”. Stay in touch! (accidental clicking of post comment 🙂 ) It’s certainly a challenge to find something breathable, stylish, and supportive for summer travel. Thank you again! Wow, that’s a lot of blisters you got for us! I like the Naot recommendation. I have taken my all-black Chacos around the world (with my hiking boots, so the Chacos were my “dress-up” shoe), but they are heavy and not stretchy. Not a problem once they’re broken in, but I like the softer look (and, from the sound of it, feel) of this shoe. Hi, Emmy! You guys are totally worth all those blisters. 🙂 Thanks for stopping by and adding Chacos to this growing list! Seeing that you walk in Seattle, I think you’ll enjoy the Naots. My research continues, but the Naots still remain in first place. If you try them, stop back by and let me know what you think! What a great write-up! Both of your final choices are open-toed sandals. Have you ever loved any closed-toe sneaker things? I already have some sandals I love, and I’m looking for the alternative to wear when I need more coverage. 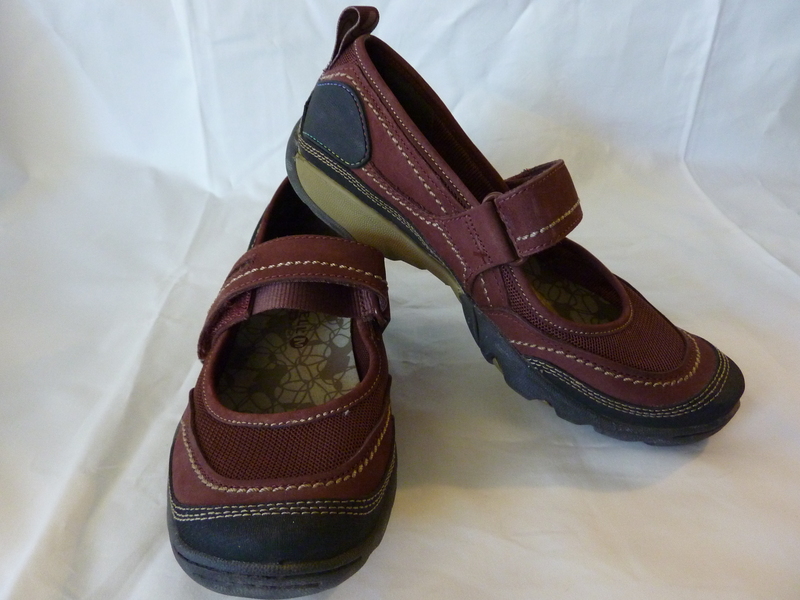 Seems like all the cute “walking” shoes are Mary Janes, which I would never wear with socks! I was hoping to find some shoes I could wear in the summer that had a little more coverage than sandals and Mary Janes. The closest I’ve come are Anne Klein’s Universaz sport loafers and Cole Haan Air Sadie Drivers. 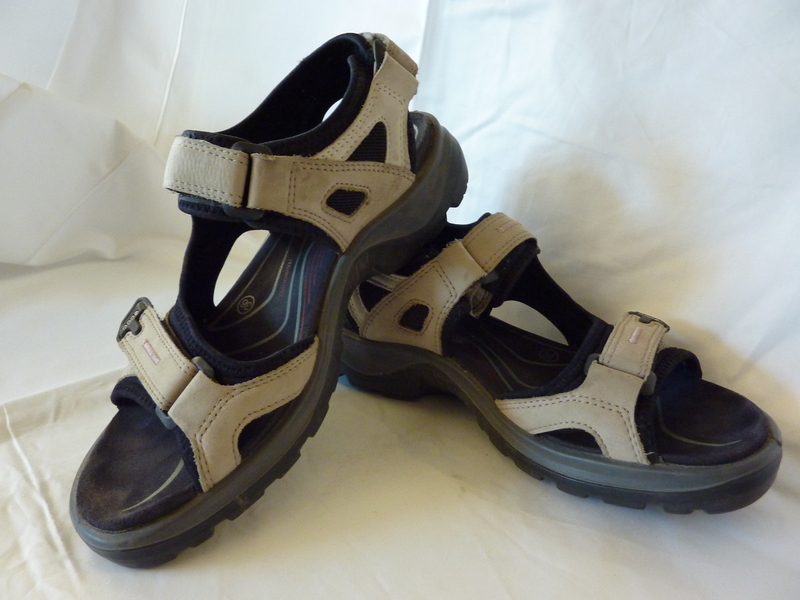 They provide some coverage, are a little dressier than sandals, and they’re fairly versatile, as well as comfortable. When it comes to shoes I can wear with socks, though, that’s a tougher one. The shoes I tend to turn to when I’m just running around an airport or on errands are my black Nike Downshifters. Outside of sneakers, finding shoes I can dress up and wear light socks with during the summer is a real challenge. I would check out Cole Haan’s line of Oxfords, or maybe an ankle “shoetie” (like bootie, but more shoe-like) from Ecco. If you find something you love, I’d be grateful if you shared it here! Thanks for stopping by my blog! Good luck in your search! Take it from me, take care of your feet! Make sure the shoe gives you support. As you age, the natural padding on the bottom of your feet thins out so you need lots of shoe padding to protect your foot bones. Wish I knew this years ago! Now all I wear are athletic shoes with an orthotic in my right shoe. Too late for me to worry about my foot looking pretty. In fact, you’ve given me an idea. I’m going to write a post about shoes and feet! Thanks! I’m glad the article inspired you, Marcella! Can’t wait to read your article on the topic!